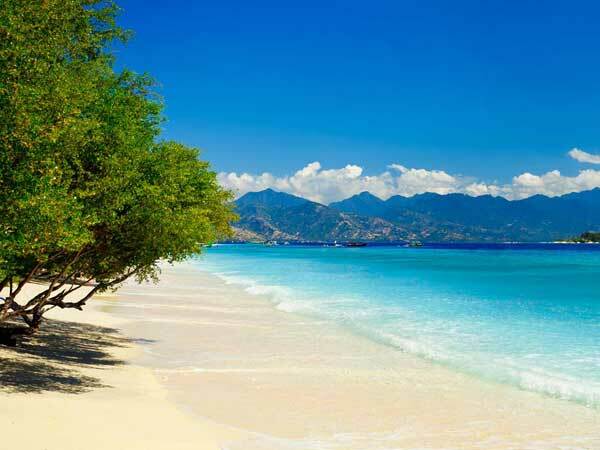 At this point, you shouldn’t be surprised when you hear about yet another picturesque beach in Lombok. The island is famous for the white-sand beaches and that crystal-clear water that the ads like to mention so much. If that is exactly what you’re looking for on the next trip, make sure to put the Sire Beach on the list of must-sees. The North Lombok district looks marvelous 365 days a year, but it will be especially beautiful if you visit during the February-April period. As you can see on the map at the bottom, this spot is located very close to the world-famous Gili Islands. It will feel like they’re just a couple of minutes away. I encourage you to rent a boat from one of the local men at the Sire Beach and make your way to Gili Air – the closest piece of land. If you’re traveling with a group of best friends, this water trip might just turn out to be one of the best experiences in Lombok. The locals will, most likely, try to rob you of your bucks (I mean the boat owners will try to rent them out to you for a steeper price than usual). Usually, when there’s at least one citizen of Lombok in your group, this doesn’t happen. Folks with bargaining skills will be able to drop that initial fee even lower. On the other hand, everything is pretty cheap in Indonesia and you’ll be fine in any case. This is one of those places that you simply have to visit with your family. It’s not noisy, the locals try to keep it clean, and you’ll get to admire the view without any kids “harassing” you and trying to sell something no tourist will ever need. When the sky is clear and the sun is shining, the majestic Mount Rinjani can be seen with the naked eye. It is one of the main attractions on the island, and you won’t even have to travel all the way up there to see it! Without a doubt, the Northern part of Lombok is well-developed and has an advanced infrastructure. There are numerous tourist spots that welcome thousands of foreigners every single year. With that said, why should you go to the Sire Beach? What’s so special about it? First of all, it’s one of the favorite beaches of the locals. They really love to spend time there and hold all kinds of ceremonies there, including weddings, birthdays, and other important events. The coastline of the beach is almost 4 kilometers long. And while the sand is not 100% white, it is very soft and your feet will get a nice massage when you walk around. The waves are always calm, perfect for the fans of water tourism. Swimming and snorkeling are available. The surfers might not like this place because of the “weak” waves, but the rest of us will definitely enjoy it. Even if you forget your favorite equipment at home, the rental spots will be more than happy to assist you with the gear. If fishing is your favorite activity on tropical islands, try to wake up earlier – that’s when there will be plenty of fish and almost no humans around. For some reason, the seagulls of the island really love the Sire Beach, and you might see them in the morning. The sun is burning brightly in Lombok; thankfully, the tall palm trees will be able to give you at least some shade. There’s some sort of a park near the beach. It’s covered in beautiful green grass and numerous trees. This is a lovely place where you can camp out with the little ones. People from all over the island and the tourists gather around in this place to have a picnic, drink some fresh coconut juice (it’s the most popular cold drink there) and have a good time. You’ll find plenty of hotels that sit right at the shore, offering the visitors incredible views of the ocean. Naturally, those hotel rooms cost a lot of money; but the Sire Beach offers accommodation options for even the most modest budgets, which means you won’t have a problem finding a place to stay. True, it won’t look as incredible as the more expensive, luxurious hotels, and you might have to go further away from the beach, but everything will still be decent. Ever heard the expression “recreational place?” Well, the Sire Beach is a fine example of that. The sunrises and the sunsets are breath-taking. The sounds of the calm waves at night will help you sleep better. There’s even a golf field in the area, and the entrance fee is quite affordable. Remember I mentioned the festivals that take place at the beach? The Dangdut show is truly awesome and will give you a chance to get to know the local customs and traditions better. It’s a celebration of the Indonesian music. I bet you’ll find yourself dancing to the thrilling beats at the end of the evening. Another famous ceremony is called Larungan. That’s when the locals offer ritual gifts to the sea so that it will keep them safe and sound. The atmosphere during this event is magical and mysterious. I made my own donation to the sea, even though I don’t really believe in that kind of stuff. But when you’re there, surrounded by a huge crowd, everything is different. Without a doubt, entertainment is a huge part of what Sire Beach is all about. This is a beach that will get you in the right mood as soon as you step foot there. Calm, peaceful, with beautiful views, affordable prices, friendly people, and tasty food – sounds pretty damn awesome from that cramped up office of yours, doesn’t it? While you can rent equipment for snorkeling, you won’t find any life jackets in the vicinity. So, bring your own if renting a boat is on the menu. As always on a beach, use sunblock and sun cream to protect your skin from the sun. Make a habit of parking your car/bike around the beach. Try to learn at least some basic phrases in Sasak – that will make life on the island so much easier! As you already know, the Sire Beach is famous for its ceremonies. It would be a great idea to read about some of the festivals/rituals in advance so that there won’t be any confusion. This isn’t critical, of course, but still, keep what I just said in mind. The shade shelters, the food stalls, and the quiet, calming atmosphere turn the Sire Beach into one of the finest spots for tourists. You can travel alone, with your partner, or the entire family. To reach the Gili Islands, you’ll need 20-25 minutes and will be back before sunset. Play volleyball, do jogging, or jump into the warm water – the choice is yours. The sunrise view is worth a million bucks, and when you’re sitting in a comfortable chair in the middle of the beach and drinking a fresh soda while watching the Rinjani Mountain, the rest of the world stops and centers around this amazing moment. Cherish it and take all these good memories back home! As I mentioned in the beginning, this place is minutes away from the Gili Islands. There’s a parking area, a public bathroom, and several hotels near the Sire Beach. It is pretty far from the Lombok Airport and the ride will take you almost 2 hours (more if traffic is bad). However, the road is pretty much straight and you won’t have to go through any potholes. It would be best to pay a taxi driver to take you there. I can say from personal experience that the flight to Lombok can be quite tiring, and you probably won’t have the energy or the desire to rent a car/motorbike and ride all the way up to Northern Lombok. Now, if you’re in Mataram, the road won’t take more than 1 hour (usually It takes 40-45 minutes). Public transports leave from Ampenan to Tanjung and from Rembiga to Tanjung. I highly recommend picking a route that passes through the Senggigi Beach. It’s one of the most beautiful places on the island and will be ideal for riding into the sunset. The Pusuk pass, on the other hand, is more “rural” and you’ll even get to see some of the local monkeys. Don’t forget to stop at the tiny villages and grab something to eat/drink. Be aware: sometimes, what could’ve been a 1-hour ride turns into a big adventure. But that’s the beauty of Lombok! Snorkeling is my passion, and I got to do a lot of that. The Sire Beach looks very peaceful, especially in the morning. The spas in the area are amazing. They are cheap, but the service is top-notch. Same goes for the hotels and the restaurants. The views at the Sire Beach are exceptional, especially when Rinjani is looming on the horizon. A great beach, no argument there. It might not be the best one in Lombok, but we did have fun on our little trip. For a romantic dinner, this beach is perfect. Wait until the sun goes down and surprise your loved one with a delicious meal under the moonlight.